Thank you for attending my Oil workshop on Saturday, it was great to see you all again. As promised this is the completed painting 'Sunshine and Showers / Whitby'. 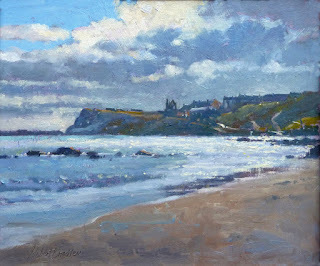 I spent around half an hour adding highlights to the distant Whitby headland and 'softening' some of the cloud edges. Finally, I completed the sea by adding a few more rocks and the sparkling light effect. The wet beach was 'cooled' down a little by adding 'blue / greys' to the still wet colour.